The education landscape in Dubai is changing drastically. Universities in the UAE are increasingly adding online courses to their programme portfolios — there are currently more than 100 and the take-up has been strong. Students with busy schedules and who want to balance education with a professional life find this form of education very helpful. However, as a relatively new approach to education, potential students must be diligent when making a choice about future courses of study. Besides considering future career prospects, there are a variety of other things to look at, from class size to accreditation. Here is a shortlist. The first step is to decide what kind of course you want to take and whether it is suited to an online environment. Online courses are good at teaching certain content but not all disciplines. “[Students] should know what they are studying and what their goals are. To try out and see if you like it is not a good strategy for online learning. That works in a classroom, but on the web you’ve got to know what you want, otherwise it’s easy to lose track,” says Malte Kollenberg, a freelance writer based in South Korea who is currently finishing an online MA in Journalism at Ateneo de Manila University. Soha Shami is currently working as a Research Associate at the Shaikh Saud Bin Saqr Al Qasimi Foundation for Policy Research, which is based in Ras Al Khaimah. She was interested in taking courses that would be of use for upcoming research projects. She has enrolled in a number of courses with Coursera. “I would advise future students to take a course that they are personally interested in to keep motivation levels up. It’s easy to slack off on a course that is online and free if you don’t have the right motivation,” she says. 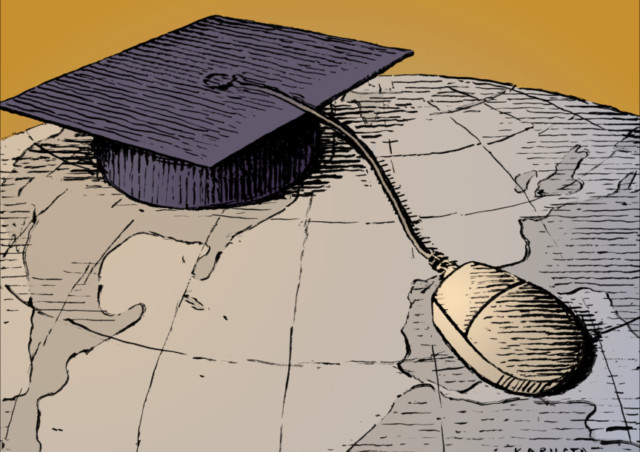 With so many online courses available it can be hard for students to choose what course to take. “The pace of technological evolution makes it difficult for students to trust the new offerings of online degrees with limited track records,” says Dr Choudaha. Referrals from people who have previously taken the same module can help you make your decision. Read public reviews and look for testimonials, survey results, completion rates and what students have gone on to do after they’ve finished their studies. Then look at the prerequisites of the course so you know if your skill set is suitable for the classes or not. “Depending on the course that you are interested in taking, you may be required to have a background in a particular discipline or topic,” says Shami. Make sure you have chosen the modules that are suitable for you. You can do this by reading the detailed course descriptions and weekly outline. Also look at the size of the class. If there are too many people, you may find it hard to voice your opinions during a virtual classroom session. Online behaviour is very different from offline, so it benefits students to keep this in mind when considering study options. An accredited course tells employers and other educational institutions that you’ve completed a course of study that is relevant, rigorous and of a high standard. The Ministry Of Higher Education and Scientific Research in the UAE recently warned students to check if their online courses were accredited following a series of complaints about unaccredited degrees from an online university actively recruiting in the country. Dr Choudaha says that while e-learning serves a vital need, it also gives some institutions the opportunity to pull students into programmes that are “substandard and unaccredited”. You can check by making sure it is affiliated with accreditation bodies such as the International Accreditation Organisation and the Council for Higher Education Accreditation. Make sure you can access your materials online. It might sound simple, but it’s something that a lot of people overlook. For some students, low bandwidth and slow computers are issues they need to resolve before embarking on the course. Faulty systems can have a serious effect on your efficiency at completing the course and your grades. Kollenberg says that the main disadvantage he had was that the online system used by the school was too complicated and not as intuitive as it should have been. While taking an online course can give you the flexibility of accessing classes at a time and place convenient to you, in many ways it can be more difficult than traditional school. Online courses require more time management and self-discipline. “Students looking to pursue online education should not only do due diligence in terms of accreditation and quality assurance approvals of degrees but also recognise that success in online degrees requires high levels of self-discipline to stick to the schedule,” says Dr Choudaha. Shami advises that creating a schedule for yourself each week will help you stay on track and ensure that you are not lagging behind in your studies. “Give yourself at least two days to work on an assignment so that you can answer it one day and check your answers again with fresh eyes on the second day,” she says.